Review: Snakes, lizards and more reptiles! Snakes and Other Reptiles is written by Mary Pope Osborne and Natalie Pope Boyce. Snakes and other Reptiles is part of the Magic Tree House series, but it is a research guide. It is the 21st research guide in the series. 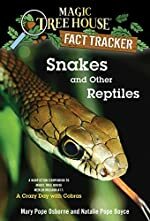 It is for any age since Snakes and Other Reptiles is a nonfiction book so people can read it for fun or to study and get a little knowledge on reptiles. Snakes and Other Reptiles focuses on snakes, lizards, crocodilians, turtles, and tortoises. It also, includes a section about the future of reptiles. Some of the most interesting snakes can "fly", spit, and strike fast over a foot. Also, readers will learn how some cultures honor snakes. For example, ancient Egyptian and the Hindu cultures respect snakes. Snakes and Other Reptiles also, includes information about predators of snakes, lizard and turtles. Readers will also learn about many different types of lizard. The biggest lizard is the Komodo dragon, and the smallest lizard is the jaragua lizard. Snakes and Other Reptiles includes sections about crocodiles, turtles and tortoises, too. It is simply filled with exciting facts about snakes and other reptiles. I liked Snakes and Other Reptiles very much since I learned a lot from it. I learned about snakes and lizards that I had never even heard about. The pictures are also really engaging. Plus on the side or bottom of the pages, the two characters from the Magic Tree House series, Jack and Annie interject some humorous facts. Finally, the facts are organized neatly so that it can be used as a good reference book as well as an interest book f pleasure. Snakes and Other Reptiles will teach readers all about snakes, lizards, crocodilians, turtles, and tortoises. I enjoyed it very much. We would like to thank Random House for providing a copy of Snakes and Other Reptiles for this review. Have you read Snakes and Other Reptiles? How would you rate it?